It’s episode 77 and my guest is Jessica White. Jessica is a wife to Joshua, mom to two kids ages 5 and 2, nurse, and podcaster. We talk about how Jessica encouraged her husband during a time of career transition, how she searched for a podcast for her children to listen to, and that all started her podcast, start Kids Bible Stories. You will love our conversation! Ok, let’s get to it! This is episode 77 with my guest, Jessica White! Help support the Friends of a Feather Podcast by ordering through our Amazon affiliate link at no extra cost to you. Thanks! Hey friends and welcome to the friends of a Feather podcast! I’m your host, wren and I’m so glad you are here! I pray this is the place where you will be encouraged by hearing God stories from my friends that I share. 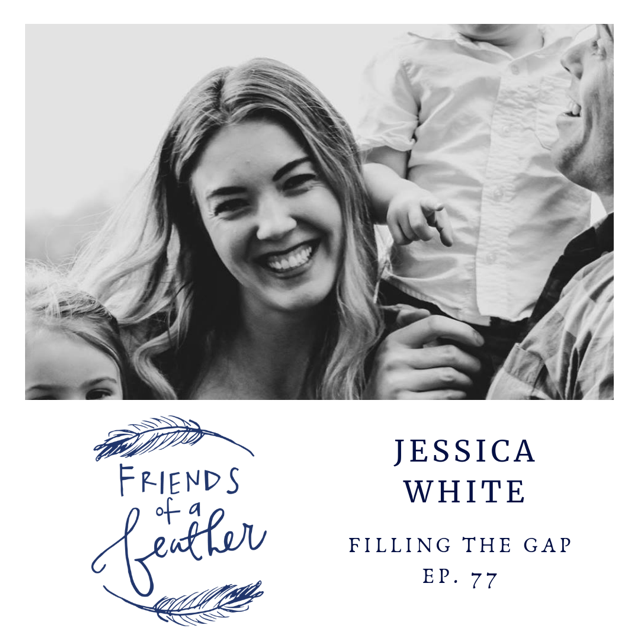 Every time you download an episode of the Friends of a Feather Podcast, I want for you to feel seen by God, to feel encouraged in your daily life, and be spurred on to honor Him with the gifts and talents He has given you. If this is the first time you've tuned in or if you've been joining in for a while, you are welcome here, friend! Ok, ya’ll Spring is here and I’m so thrilled about it. The birds singing, the sunshine, the warmer temps have me smiling when I walk outside! So I told you in last weeks episode that I had some fun news to share with you! I’m having a giveaway! I rarely host them, but this one you don’t want to miss! My goal here on the podcast is to encourage you in the stories I share, to share helpful content such as books, and podcasts, and products that have helped me, and I want to be able to share that with as many women as I can. In order to do that, Apple podcast reviews help in such a big way! Here’s how you enter the giveaway. All you have to do is go to the podcast app on your phone, search for the Friends of a Feather podcast, scroll until you see the headings Ratings & Reviews and click Write a Review. I would love for you to tap 5 stars, type a sentence or two about what you love about listening to the podcast. Screen shot your review and email or direct message it to me! That’s it! But, what if you are saying, ‘wait, Wren I’ve already left a review on the podcast?' I would first say Thank you! And then I would say, no problem, just screen shot your past review and send it to me! Head to you the Apple Podcast app, Stitcher app or click HERE to write your review. Ok. So all who enter can have a chance to win a NEW Val Marie Paper 30 day prayer journal! It’s called A FRESH START FOR MOMS and it hasn’t even been released yet! EEK!! Thank you to Val at Val Marie Paper and Mariah at Tyndall Publishing for gifting the winner this awesome journal. Ok, so go leave those reviews and I can’t wait to see who wins!! Let’s get to today’s episode! It’s episode 76 and my guest is Jessica Thompson. Jessica is a sunny California resident, a wife, mom, writer, author, podcaster, and frequent guest speaker. Jessica has written books about exploring and infusing your relationships with grace and the love of Jesus. She has also coauthored books with her mother Elyse Fitzpatrick including the book I recently read, Give Them Grace. 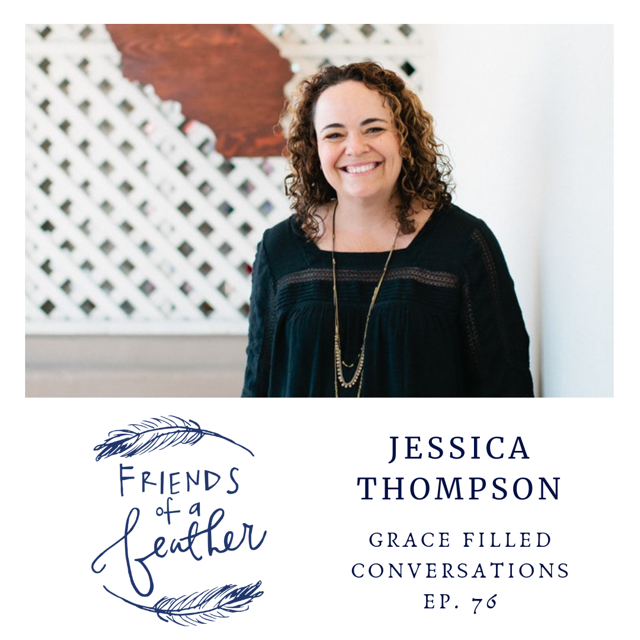 Jessica and I chat about a conversation she overheard from her son and his friends that focused her attention to write the book, tips for how to integrate gospel conversations with your kids, and an acrostic that can help you in beginning these conversations. Jessica was so fun to interview, is an excellent speaker, and I know this will be a very helpful episode for all of us. Hey friends! I'm so excited that Spring weather has been coming and that means Summer is around the bend! So glad you are here! I pray this is the place where you will be encouraged by hearing God stories from my friends that I share. Every time you download an episode of the Friends of a Feather Podcast, I want for you to feel seen by God, to feel encouraged in your daily life, and be spurred on to honor Him with the gifts and talents He has given you. If this is the first time you've tuned in or if you've been joining in for a while, you are certainly welcome here, friend! We will have a brand new episode for you next week. But, today, it's a Top Ten with Wren episode! I love these episodes because I love sharing ideas that are easy, practical and intentional! 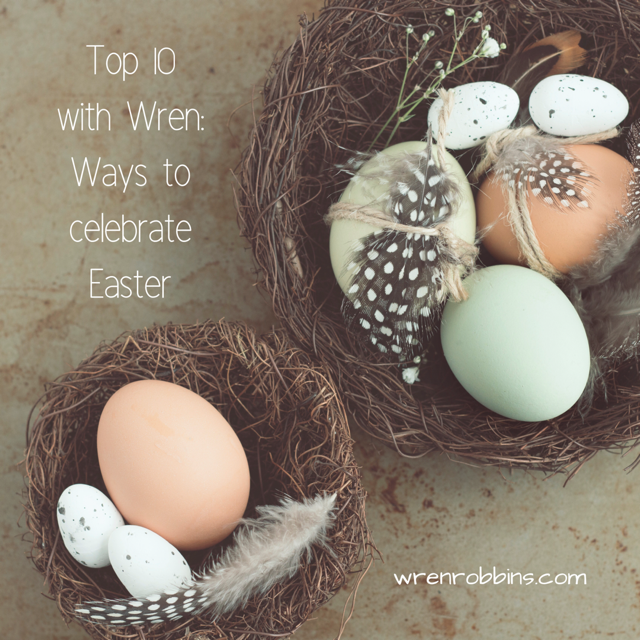 After the next few minutes, you will have 10 great Easter ideas to make this Easter a very meaningful time for you and your family. Check out all 10 at the link below. This episode, ya'll. My friend, Holly sent me a message me one day and said, "Wren. You have got to hear Jess’s story." After Jess had spoken at a Veterans Day event, Holly immediately went up to encourage her. Holly connected Jess and myself and I’m so grateful for Holly knowing what an impact Jess will make, and that she has been an encouragement for Jess to share. Jess has only spoken in public a few other times and I’m so grateful she entrusted me in sharing her story with you today. Jess takes me back to her life of searching for her identity as a young preteen girl, and how she kept coming up feeling empty throughout her life. One morning, after putting her five month old baby girl in her swing for a nap, Jess was devastated with a knock on the door with the news that her first husband, Tell had been killed in action while he was stationed in Iraq. God used a sympathy card filled with verses from a friend she hardly knew that drew Jess to God’s word. In her desperation, Jess found a Bible in her home and dove in head first into reading the scriptures. 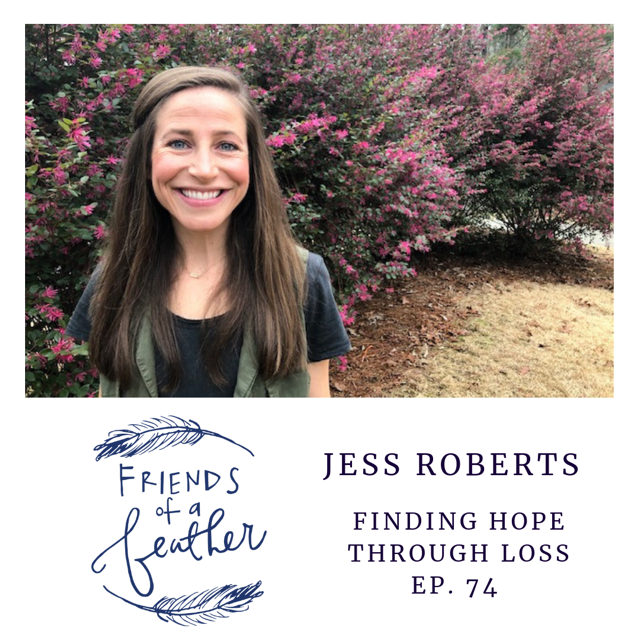 In this episode you will hear how Jess came to faith in Christ after visiting with a friend at his church. This friend eventually became her husband, a man who passionately loved God and those around him. Ya’ll Jess is using all of her story to glorify Him. And, I’m so grateful. I pray you will walk away encouraged, feeling seen and loved by God, and praising God who redeems us. All of the links and things Jess and I talked about will be in the show notes below. Ok, One more thing! If you were encouraged by what you heard today, I would love for you to forward this episode on to a friend! I think that we are all better together and today is the perfect time to give that friend in mind some encouragement. Help support the podcast by ordering through our Amazon affiliate link at no extra cost to you! Thank you!